La Bloga: Get your tickets now for Tía Chucha's Gala 2018! In many ways, La Bloga is a celebration of Latinx culture in its many forms: literature, art, food, politics, you name it. And we try to bring you news of where and how you can join in the celebration. Tía Chucha’s Centro Cultural in Sylmar one such place to celebrate culture. The mission of Tía Chucha’s is to transform community in the Northeast San Fernando Valley and beyond through ancestral knowledge, the arts, literacy and creative engagement. Tía Chucha’s began as a café, bookstore and cultural space owned and run by former Los Angeles Poet Laureate Luis J. Rodríguez, his wife Trini Rodríguez, and their brother-in-law Enrique Sánchez. Tía Chucha’s provides year-round on-site and off-site free or low-cost arts and literacy bilingual intergenerational programming in mural painting, music, dance, writing, visual arts, healing arts sessions (such as reiki healing) and healing/talking circles. Workshops and activities also include Mexica ("Aztec") dance, indigenous cosmology/philosophy, and two weekly open mic nights (one in Spanish, the other in English). Tía Chucha’s host author readings, film screenings, and art exhibits as well. 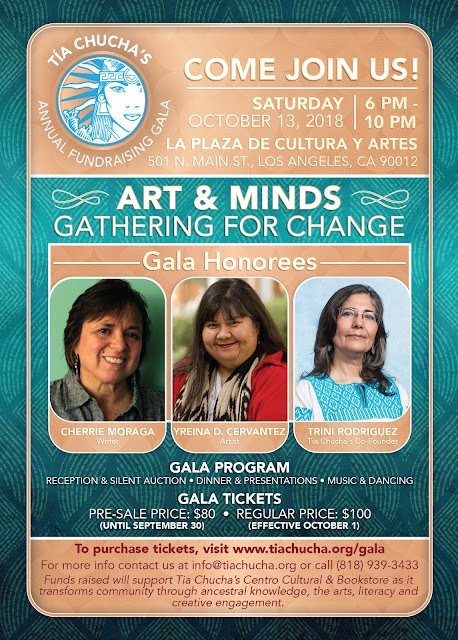 Now is your chance to celebrate the spirit of Tía Chucha’s at its annual gala, Saturday, October 13, 6:00 p.m. at Plaza de Cultura y Artes, in downtown Los Angeles. The honorees are Cherrie Moraga, Yreina D. Cervantez, and Trini Rodríguez. Tía Chucha's Gala not only allows the community to come together and celebrate our collective achievements, it also allows a celebratory space to honor those who have given to our community. Also, it provides a chance to help raise the much-needed resources to continue Tía Chucha's mission. So, please buy your tickets now by going here, and if you purchase before September 30, you will pay the lower, pre-sale price. And we look forward to seeing you!